Job Burnout: Do You Have it? There’s a big difference between job dissatisfaction and burnout. Burnout is an all-encompassing sensation that wrecks your personal life, too. Almost all jobs get annoying at some point, but burnout has an emotional and physical impact that’s tough to overcome, and academics are especially vulnerable to it. This week, I’m tackling the subject of burnout–from how to figure out if you have it, how to deal with it and how to prevent it. While reading up on burnout, I realized that, if burnout could take a human form, it would be as a workplace bully. In the end, you have to know how to detect it and how to stand up to it so you can get your work done and stay sane at the same time. So, first, how to tell if you are burnt out or just stressed. All jobs have stress, and people react to stress differently. Some people freak out if they catch a serial comma on an AP style page, while others won’t complain even if they’re asked to work until midnight. It all depends on the person, but the basic symptoms of burnout are hard to ignore. 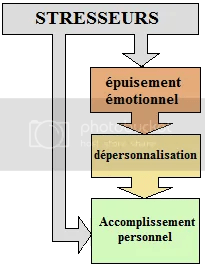 The Maslach Burnout Inventory in French by Micthev from Wikimedia Commons under a Creative Commons license. Subscribe to comments with RSS	or TrackBack to 'Job Burnout: Do You Have it?'. If I could give an award to PostAcademic for Best Post of the Year, this would be the one. I will forward it around to colleagues everywhere, and place it in my Technical Communication/Writing e-folder for future students. Thank you! We’re here to help, and there are two more posts on job burnout after this one. I’d be thrilled if we could keep at least one person from burning out. I agree with Mackie Blanton! I scored a 55 on that test. I guess I’m pretty burned out, huh? Oh, test! Right! I’d forgotten all about that self-test. So I just took it: I’m on the cusp of “Be Careful.” Perhaps I should go back into retirement.